Dr. Srilakshmi Maguluri is a thorough, attentive ophthalmologist, who treats her patients with compassion, placing their health and comfort as her highest priority. Dr. Maguluri currently provides care for diabetic eye disease, hypertensive eye disease, macular degeneration, retinal disorders, macular puckers, macular holes, torn retinas, flashes and floaters, and uveitis. Dr. Maguluri is certified by the American Board of Ophthalmology. She is multilingual in Spanish, English, and Telugu. She is a member of the Association for Research in Vision and Ophthalmology, the American Academy of Ophthalmology, and the Pan-American Association of Ophthalmology. She received her undergraduate degree from the University of Rochester in New York, her medical degree from the University of Medicine and Dentistry of New Jersey before completing her ophthalmology residency at Louisiana State University. She completed a vitreo-retinal surgical fellowship at the Vanderbilt University Medical Center. 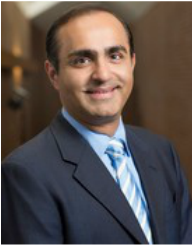 Dr. Ahuja is a dedicated ophthalmologist committed to providing a high level of experienced care for his patients. Dr. Ahuja currently provides care for diabetic eye disease, hypertensive eye disease, macular degeneration, retinal disorders, macular puckers, macular holes, torn retinas, flashes and floaters, and uveitis. He certified by the American Board of Ophthalmology. He is multilingual in English, Spanish and Hindi. Dr. Ahuja received his undergraduate education at Northwestern University in Evanston, IL, his medical degree at Rush Medical College, Chicago, IL ophthalmology residency training at Kresge Eye Institute of Wayne State University in Detroit, MI, a medical retina fellowship at Moorfields Eye Hospital in London, England and a surgical vitreo-retinal disease fellowship at the University of Maryland, Baltimore, MD. He is a member of the American Society of Retinal Specialists, a senior fellow of the American Academy of Ophthalmology and past president of the Chicago Ophthalmological Society. Dr. Ahuja aims to treat his patients with the quality of care he himself expects. At Lake Shore Retina we seek to provide a boutique-esque atmosphere for medical & surgical eye care in an office that focuses on each patient with attention and individualized care. We strive to maintain high standards in delivering ethical and competent care. "Great bedside manner. Really nice office with modern equipment. Convenient location near the Red Line train and Broadway bus. I will be back"